In this article E-Pandu will explain several methods to find inverse matrix values ​​that are larger than 2 x 2 using elementary and determinant row operations. A matrix n x n is called an elementary matrix if the matrix can be obtained from a matrix of units of n x n namely In by performing a single elementary row operation. For the I4 exchange the second row with the third row. If matrix A is multiplied to the left by an elementary matrix E, the effect is to demonstrate ELO to A. The elementary E matrix is ​​produced by doing a certain ELO on Im and suppose A is a matrix m x n. Then the EA product is the same as the matrix produced by doing the same ELO on A. Calculate the A Matrix below using Elementary Line Operations and E and A Matrices then compare the results. Note: E matrix is ​​the result of adding (3 x) the first line from I3 to the third row. 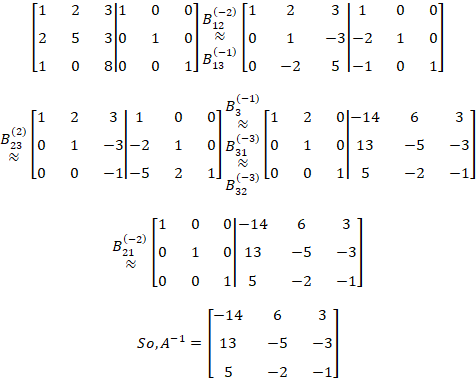 If the ELO is applied to the unit matrix I to produce an elementary matrix E, then there is a second row matrix operation which when applied to the E Matrix will return the I Matrix. 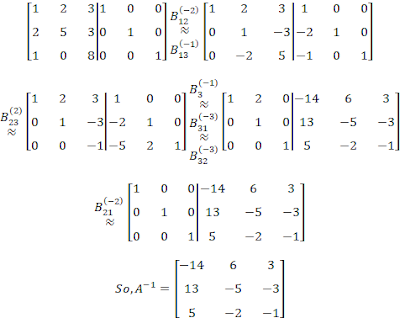 For example, if the E matrix is ​​obtained by multiplying the i-line from I with the k constant not equal to zero, then I can be found again if row i of E is multiplied by 1 / k.
The right-hand operations of this table are called Inverse Operations from the corresponding operations in the left section. The A matrix has an inverse if and only if Matrix A is the equivalent of a line to I. We will reduce matrix A to the unit matrix using row operations and apply these operations simultaneously to matrix I to produce A-1. This can be solved by holding the unit matrix to the right of matrix A and by applying row operations to both segments until the left segment is reduced to matrix I. Then the final matrix will have the form [I | A-1]. This calculation can be done as follows. Note: in determining A-1 if a zero row is obtained on the left-hand side, then A-1 cannot be found or A has no inverse. Next, we will show how to determine inverses by using determinants which in solution we need Adjoin from the matrix. Because in the previous "Rules for CalculatingDeterminants" article we discussed how to determine the adjoining of a matrix, then in this article the discussion will begin with the following theorem. 0 Response to "Elementary Line Operation Methods and Determinants for Finding the Inverse Matrix"